Soothe the pain of growing older with this funny personalized milestone birthday gag gift! Direct from the “Fountain of Youth” Pharmacy, this clever gift set features two realistic-looking medical vials and comes complete with 2 movie-theater sized boxes of sour Lemon Heads® that can be used to fill the prescription. 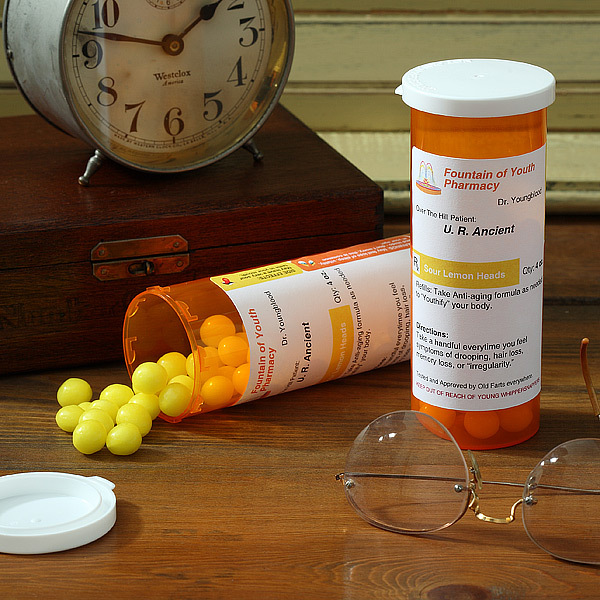 The clever warnings, directions and side effects on the labels are sure to make everyone laugh! The medicine bottles are packed in a traditional white pharmacy bag with a matching label on the front – ready for gift giving. If you’re looking for a last minute gift, this is a great choice – choose express shipping to receive the gift in just 2 days. Priced at just under $15, this is a lighthearted gift that’s sure to cure anyone’s over the hill blues!